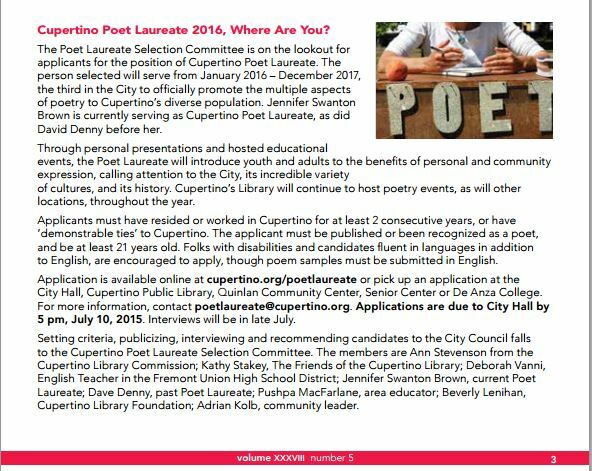 Summer has been a busy time, for me, and for Cupertino poetry lovers. I’ve been away from this blog, doing my poetry work, spending time with family and vacation. But there’s been poetry action, and with this post I want to give an overview of what’s been happening in the past three months. I spent some great time with a friend and her son reading poetry and exploring this local park. Check out the videos! My PL colleagues Erica Goss and David Perez invited me to give a lesson to their teen girl campers. The search for the third poet laureate for our city was a lot of hard work, but our committee was great and interest was high! Students from this special summer camp presented their video poems at the Milpitas Library. Photos and video on this page. Press from the summer here. I had a great vacation and spent some time with poetry and favorite American poets.